What an AMAZING two years for FroKnowsPhoto.com. The site launched June 1st 2010 with almost no readers, no youtube following, no twitter following and no Facebook following. It all started with an idea to make fun and informative video content to help photographers of all skill levels. Well here we are two years later and with your guys help the Fro community has grown into an AMAZING resource for photographers. I om very thankful for all of your support as the site has grown and will continue to grow. As a thank you I have uploaded a 60 min long Flash Photography video that Adam and I filmed. I have been waiting for a special occasion to release this video as it is part of something I am working on for the future. If you have signed up for the Fro Email list you would have received an e mail with a private link to access this special video. If you are not on the e mail list as of yet please sign up above where it says “Free Photography Guide” and once you verify your e mail address you will get access to the 60 min Flash Video. 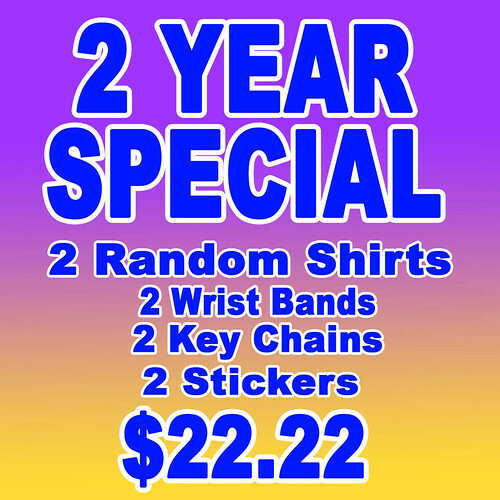 As a second thank you I have created a 2 Year Anniversary 2 shirt random special in the store!!!! For $22.22 you will get 2 random t-shirts, 2 Key Chains, 2 Wrist Bands and 2 stickers CLICK HERE to pick yours up. This special sale will end on 6/9/2012. Super Mega Giveaway Extravaganza Award Show: Did you WIN? CES 2015 Recap – NOT the Typical BORING Coverage… I almost Punched Someone, where’s the bathroom? OMG! These photographers are floating on air!